Cherry juice is not only refreshingly delicious, but it provides some solid health benefits, too. With about 120 calories per 1-cup serving, it’s rich in nutrients like potassium and iron. There are many different varieties of cherry juice. Look for juices that use 100-percent cherry juice with no added sweeteners. 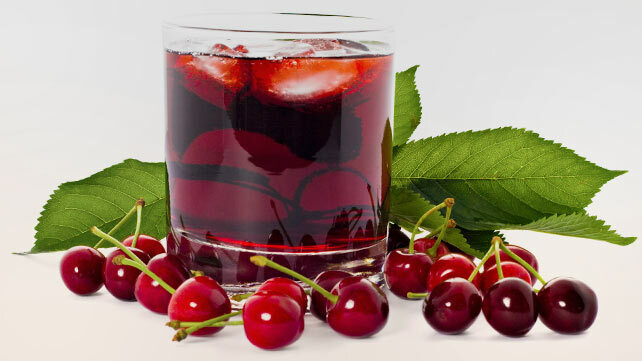 Cherry juice “cocktails” typically add sugar and preservatives. You will also see juice “from concentrate” and “not from concentrate.” Both options are nutritionally similar. “Not from concentrate” means they put the fresh juice directly into the bottle. “From concentrate” means they squeezed and then filtered the juice, extracting water. It is then rehydrated and packaged. There are also different types of cherries used to produce juice. Tart cherry juice is sour to taste and provides a higher amount of anthocyanins compared to black cherry juice, which is sweeter in taste and has less anthocyanins. Anthocyanins promote anti-inflammatory processes in the body. Both are great, nutritious options. Read on for seven reasons to sip and savor. Cherry juice may help recovery post-exercise. It is naturally high in potassium, which conducts electrical impulses throughout the body. This mineral also helps maintain blood pressure, hydration, muscle recovery, nerve impulses, digestion, heart rate, and pH balance. Cherries contain about 330 milligrams (mg) of potassium per cup, which is almost 10 percent of your daily recommended value. Research shows that the antioxidants in tart cherry juice can reduce pain and inflammation from osteoarthritis (OA). A 2012 study showed that drinking cherry juice twice a day for 21 days reduced the pain felt by people with OA. Blood tests also showed that they experienced significantly less inflammation. Like all fruits and vegetables, cherries pack a powerful antioxidant and antiviral punch. Flavonoids, a type of antioxidant in cherry juice, are made by plants to fight infection. Research shows that these chemicals can have a significant impact on immune system function. The anti-inflammatory properties of cherry juice combined with a dash of sleep-regulating melatonin may help you sleep better, according to a small 2010 study. The results suggest that tart cherry juice has similar effects as insomnia medications like valerian or melatonin on older adults.